Get your cape on with the DC Super Hero Girls(TM)–the unprecedented new Super Hero universe especially for girls! Readers of all ages can fly high with the all-new adventures of Wonder Woman(TM), Supergirl(TM), Batgirl(TM), and some of the world’s most iconic female super heroes as high schoolers! 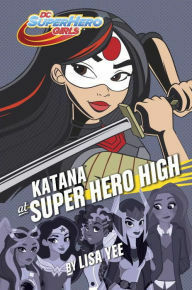 Sword-wielding Katana isn’t like most high school students–but with classmates like Wonder Woman, Batgirl, and Supergirl, Super Hero High isn’t like most high schools! In addition to training to be a super hero, Katana also follows the noble warrior traditions of the Samurai. Now an unknown source has given her the responsibility of guarding a hundred ancient Samurai swords–but why her, and for what purpose? With the help of Wonder Woman, Supergirl, Ms. Martian, and some of her other super friends, she intends to find out. But she just made captain of the fencing team, she has a huge school project due, and a villain with ties to her family’s past seems to be amassing an army. Maintaining her inner peace isn’t going to be easy . . .
. . . but Katana has the steel to save the day! Award-winning author Lisa Yee brings this edge-of-your-seat adventure to life with mystery, thrills, and laughs. Move over Batman(TM) and Superman(TM)–the DC Super Hero Girls are ready to save the day and have fun doing it!